If you fertilized in the fall, you should be noticing that your lawn already looks greener than those of your neighbor’s who did not fertilize. If you didn’t fertilize this past fall, no worries, just try to remember to do it next fall. For our Northern Illinois region, it’s a good ideas to apply a light application of fertilizer at the end of March / beginning of April. Don’t overdo it! Too much fertilizer at this time of year can cause too much premature lawn and weed growth and grass diseases. Apply about a quarter of the recommended amount of fertilizer at this point. Later, in mid-to-late April, you’ll want to use a full fertilizer application that contains a pre-emergent weed control. It’s much easier to stop the weeds before they get established. Preventing the weeds from taking root will save you the time and effort of pulling them later. Aerating your lawn will allow oxygen and nutrients to more easily reach grass roots while alleviating soil compaction that stifles grass root growth. Either hire someone or rent a core aerator to aerate your lawn. I do prefer CORE aerators over the spike aerators. Core aerators will remove a small plug of grass and soil. These cores will dissolve back into the lawn in a week or two. Spike aerators will not provide as many benefits to your lawn as the core aerator. 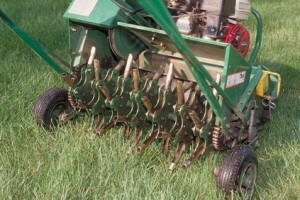 Spike aerators will press a hole into your soil, and in my opinion, will only further compress the soil in time. Be sure you do not aerate when your lawn is very wet, doing so will likely damage your lawn. Wait until the soil is moist, but not saturated. 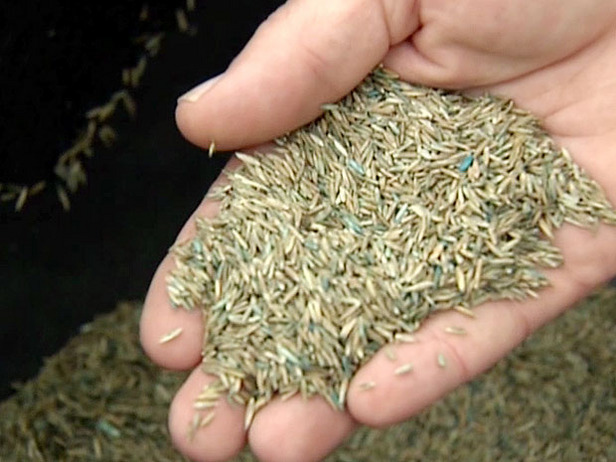 The best time to over-seed your lawn is in the spring. I highly recommend over-seeding very soon after aerating your lawn – your seed will not wash away and will have far better soil contact. Be sure to use a high-quality grass seed that is suitable for your light and moisture conditions. You will want to purchase a blended grass seed that contains both annual and perennial grass seeds. Spring is a great time to over-seed because of the cool temperatures and moist conditions. Before you need it, get your lawn mower ready to go. Give it a thorough cleaning underneath and on top. 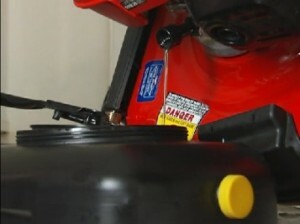 You’ll want to change your lawn mower oil (this should be done a minimum once per mowing season). Replace your mower’s air filter and check the spark plug to be sure it is firing properly. Another great way to prepare your mower is to either replace the mower blades, or remove the existing blades and have them sharpened. Local hardware stores like Ace are great for this. If you have any more spring lawn care tips, please post them in the comments section below. « Tea for Three – Mommy, Doll and Me!